I was browsing Joann's last week for some craft supplies when I spotted this cozy, plaid flannel. I left the store without it that day, but couldn't help but go back a few days later to grab some. It was practically begging me to make a scarf out of it! After all, who knows which box my scarves are in...or which storage unit, for that matter! Just kidding...kind of. I hope I can find them before it gets too chilly! At least I'll have this one in the meantime! I think I have some time to locate my other ones though, considering it's going to be 95 degrees today! Sheesh. 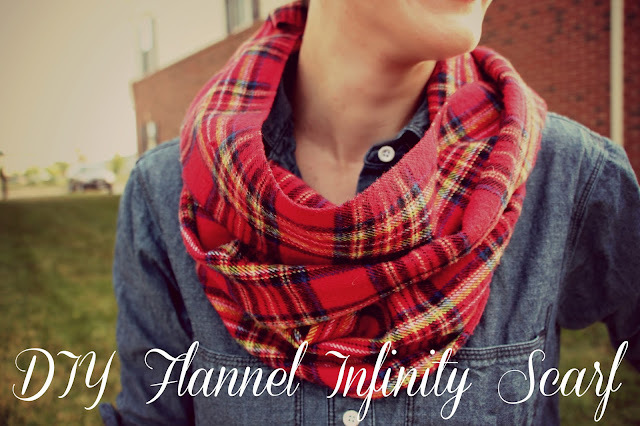 Anyway, if you'd like to make your own adorable scarf for fall, follow the steps below! I cut my scarf 12" wide and used the whole 2 yards for length. One of my long edges was the selvage (factory-finished edge), so I only had to finish one myself. I used a double hem so that no raw edges of the fabric were showing. Just fold your hem over twice, pin it in place, and sew. As for the short ends of the scarf, cut off any frayed ends. Then, pin the clean ends together, with the right sides of the fabric facing each other, and sew. This step is going to join your scarf together so that it's one continuous loop. Once you've sewed the ends together, there's just one last step to finish off your scarf. This is probably not a "correct" sewing technique, but I just figured it was the best way to keep the raw edges in check. These will be on the inside of the scarf, but still...I didn't want any fraying to happen from washing or everyday wear. Take the raw edges that you just stitched together, and fold them down flat, against the back of the scarf. 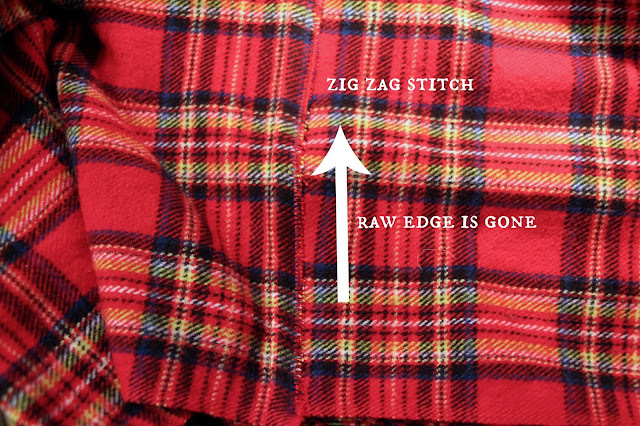 Sew a zig-zag stitch all the way down to cover the raw edges. Then you're done! Just flip your scarf right side out and it's ready to wear! Thanks to my sweet hubby who took these pictures. He was like the paparazzi on the red carpet...just snapping away and I couldn't stop laughing. I gave up trying to get a "good" shot! Just so you don't feel left out of the fun...here's me. Just doing a jig, or something...too bad you can't see my legs! Hope you like this easy little DIY! Happy scarf-making! 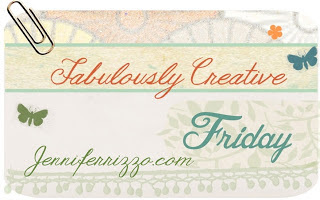 I'm linking up with Jennifer Rizzo's Fabulously Creative Friday! LOVE Flannel!! 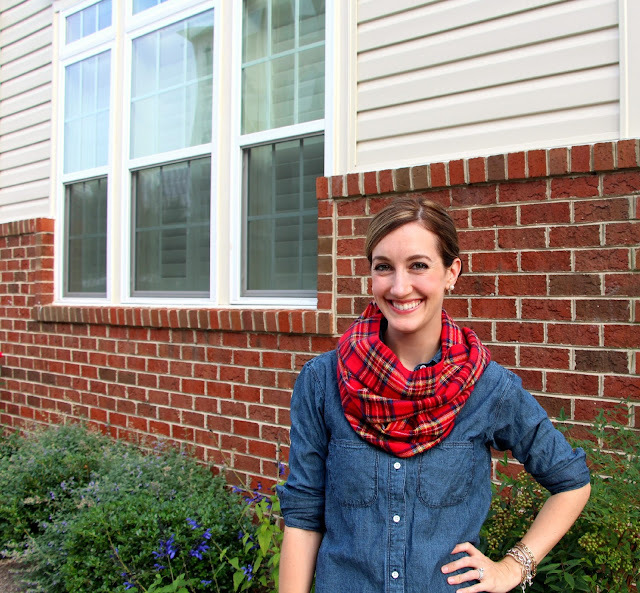 I would have NEVER thought of doing it up in a scarf like you did! PURE GENIUS!! Thanks so much! Glad you enjoyed the project! Love your scarf!!! Btw- about how wide is it? Oh sorry! I just re-read your post and saw it was 12 inches wide. Going to get to work on my purple/gray/blk plaid one right now!!! Thanks again for your post! Cool tutorial... thanks a bunch! Cane Chair Makeover - Part 3 - The Reveal! What I wore: Rent the Runway...again!